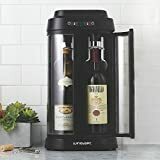 No matter whether you are a true wine lover who loves to share your finest bottles with friends, family, and guests at home or a professional in the restaurant, entertainment, retail, or hospitality industry, then you need to check out this cool new WineStation 3.0. This is no mere box of wine chilling in the fridge, this is a sophisticated, state-of-the-art wine dispensing and preservation system that can not only keep up to four bottles of wine properly chilled and in pristine condition, it can also dispense in three pour sizes: taste, half, and full glass at the touch of a button on the built in LCD touchscreens. Enjoy different wine varietals at your leisure. No more opening up a great bottle and then not getting to finish it while it's still fresh. 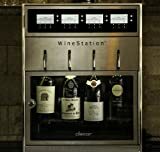 It features dual zone temperature control for either red or white wines, an advanced thermo-electric cooling system for precision temperature control, patented clean pour dispensing, dual safety locks, 60 wine preservation while inside the system, 14 day wine preservation while outside the system, and LCDs that display the wine varietal, temperature setting, and pour sizes. 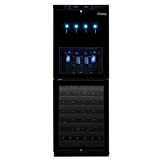 They can be used on countertops or built-in and if you need to dispense more than 4 bottles, additional units align beautifully alongside one another.